Sharky 775 Heat & Cooling Energy Meters. Free life time support and customer service, exclusively from Stockshed. UK sales, distributor and stockist of RHI compliant Sharky heat meters manufactured in Germany by Diehl Metering. Extensive UK stock of Sharky 775 heat meters for fast delivery. Compact and economical Sharky 774 available in 1/2" and 3/4" BSP sizes with MBus or Radio output options. Support for correct meter sizing and selection for your application. Lowest price guarantee. Show us your quotation and we will beat it. Automated meter reading and tenant billing / cash collection services. 24 x 7 customer service and support. Installation and commissioning service available. Meter sizes: 1/2" BSP (DN15) to DN100 Flanged. Nominal flow qp 0.6 - 60 m3/h. All heat meters MID class 2 approved to EN1434. RHI compliant. Welcome to Stockshed Limited. 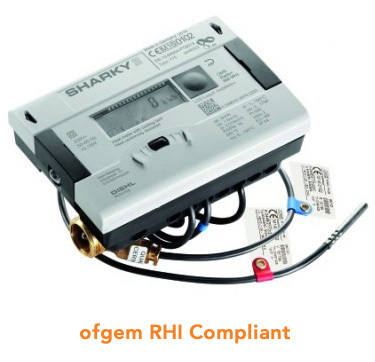 Official UK distributor, stockist and customer service provider of Sharky MID & RHI approved heat and cooling energy meters including Sharky 774 and Sharky 775 range of meters, remote meter reading (AMR) solutions and billing management services. The Sharky meter is a global market leader, engineered in Germany, and was the first ultrasonic meter to gain MID class 2 approval to EN1434 making it suitable for the RHI scheme. With extensive UK stock, we are able to supply Sharky heat or cooling energy meters when you need them. We also stock spares and accessories for current and discontinued meters. Our unparalleled technical support and product knowledge is available to assist you with meter selection or advice, 7 days a week. All Sharky heat meters are Class II, MID approved in accordance with EN1434 and RHI (Renewable Heat Incentive) compliant. Stockshed Limited. The smart choice for heat & cooling meters, automated meter reading solutions, billing and cash collection management services, open 7 days a week. MID Approval to EN1434 for RHI.